This month’s Writer’s Station prompt is Free Writing: a type of writing exercise where, for a set period of time, you write about whatever comes to mind without worrying about spelling, grammar, or topic. This exercise helps writers write freely without self-criticism, and can be used as a brainstorming tool to develop ideas for more formal writing. This month your task is to sit down for 20 to 30 minutes and free write about whatever comes to mind. It’s okay to write about completely different things and switch between multiple topics during a Free Writing session. Whatever you think about, write down! 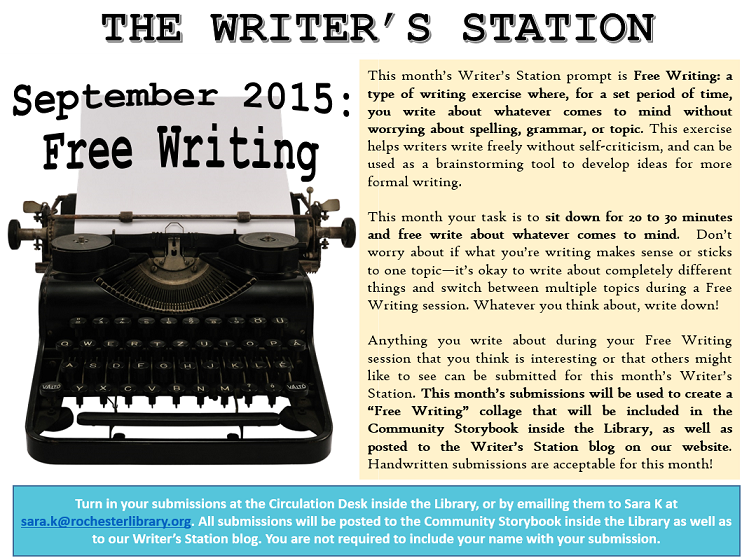 Anything you write about during your Free Writing session that you think is interesting or that others might like to see can be submitted for this month’s Writer’s Station. This month’s submissions will be used to create a “Free Writing” collage that will be included in the Community Storybook inside the Library, as well as posted to the Writer’s Station blog. Handwritten submissions are acceptable for this month!